Here is a small collection of french models (known or build by myself for oldies). Now in France, card models are not largely distributed and it is really difficult to find a card model in french bookshops! Models printed around 1950 : full colors, tab and slot construction, fairly simple. Many models of road vehicles, trains and aircrafts. Models named "Constructions de précision", printed from 1930 to 1970 and published by "Le Pélican Blanc" : not very precise printing but good looking. Each big model is presented in a 30x40cm booklet . * The french railway weekly magazine "La Vie du Rail" published in 1970-1980 some cardmodels in the same fashion. Named "The precise model" aircraft or vehicle models printed between 1930 and 1960: very good printing with instructions on backside. Cardstock generaly too hard to make round surfaces! But complex buiding and good looking. Die-cut models designed by Publicis and free distributed in gas-stations SHELL in 1959-60. More than 30 oldtimer cars models in collection. Not very accurate but funny simple models. Scale approximatly 1:32. A serie of aircrafts of the beginning was launched after under the name "Ailes d'Autrefois" but I have got only the #1 model. In 1950-55 many card models were distributed free by "Tour de France" commercial caravan... like Lesieur 2cv reprinted by Citropolis. 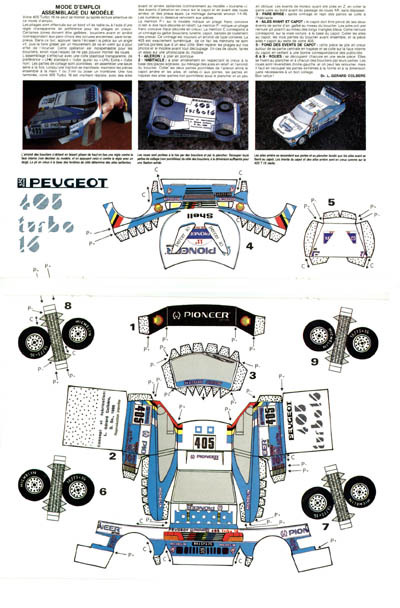 During the 1985 Paris-Dakar rallye, Peugeot has published a 405GT model. Architectural models published in 1980 (?). Book 25x33 cm. Printed in two colors. Booklet monthly published by Larousse from April 1983 with the title "200 years in aviation and space technology". Each booklet (format 24x30cm) presents an historical notice and a cardmodel. Number #1 is the famous SPAD VII with a 1/30 scale model. Number #2 and #3 were Messerschmitt BF-109 and Spirit of St Louis. Good printing but design is questionable! I'd never found other issue. Collection of cardmodels for childrens (1950-1955?). Vivid colors and simple drawings. Aircrafts and ships. 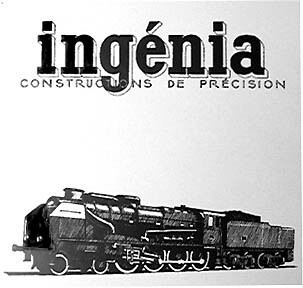 Publisher of Ingenia models. Collection of cardmodels for childrens (1936-1950). Assembly without glue. Planes, ships at 1:700 scale, buildings. Large collection of cardmodels for childrens (1950-1955?). Assembly with tabs without glue: so cutting was sometimes wriggled. Vivid colors and simple drawings. I remember only architectural models: farms, churches and traditionnal french houses. Historical architecture theme : die-cut two-sided printed models with movable parts to view inside building. Scale 1/100 or 1/200. Booklet 22x31 cm. Full assembly instructions are included in french, german, dutch and english. Published in 1985-89. Very fine print and good looking models. Reprinted "Toys Models" from Ravensburger publisher translated in french and distributed in 1989-90. Simple models with moving parts: site's crane and firebrigade truck. Collection "Pierres de papier" : more than 20 architectural models published since 1985. The publisher has now (january 2002) stopped any activity! Some models are in PMI, Marcle Models and S&S catalogues. What a pity! Models were fine printed and very good looking. Notre Dame de Paris (1985) 24x32 cm, 8 sheets, in french, german and english. Scale 1/400. Reprinted in 1991 with some improvements on main portal. Montmartre and Sacré Coeur minster - Paris. 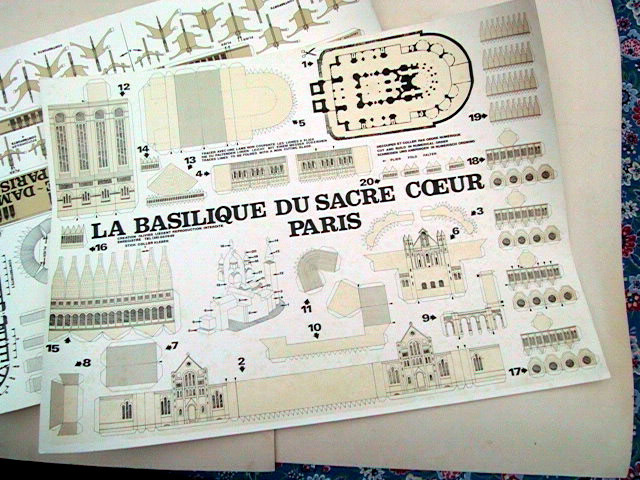 Ecole militaire - Paris (1988) A4 format, 8 sheets, 168 parts. Instructions in french, german and english. Scale 1/250. Chenonceaux castle (1987) 59 parts, scale 1/250. Chambord castle (1988) 65 parts, scale 1/380. Mont Saint Michel (1994) 170 parts, scale 1/800. Romanesque church and cloister (1993) 76 parts, scale 1/87 (HO). Cars and trucks big models with functionnals wheels and steering. Military serie with Dodge WC 62-63 models at scale 1:18: 8 sheets A4 with a large sheet with instructions. Citroën serie with 2CV Berline and 2CV Van at scale 1:12: 8 sheets A4 with a large sheet with instructions. The author has now stopped this activity (January 2004). With this editor's name, I found two architectural models published in 1994: Notre-Dame de Paris and the Roman Coliseum. Each model is printed in a booklet with 23x30cm size. The scale is not specified but seems to be the 1:100. These models are in fact a french edition of a spanish original edition named: Susaeta Editiones SA.Madrid. Others: Glanum, the roman town: 30 sheets, 1/200. 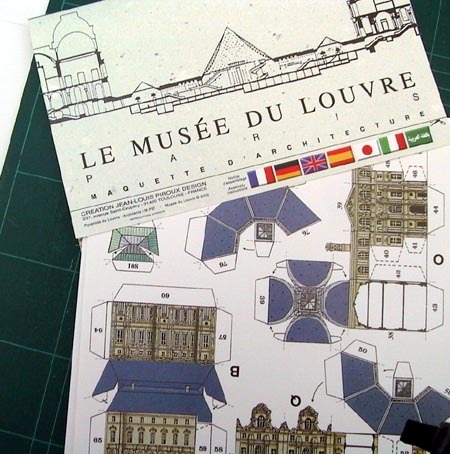 3D Postcards: more than 100 architectural models and distributed in french booksellers. Each very little model is on a postcard (12x17 cm). Difficulty and look like english "Micromodels". The card stock is heavy for the size. But many models are nice. Distributed like postcards, schematic simple die-cut models. More than 50 models in the collection. Construction with tab and slot. Many different scales, toy or diorama looking. Printed in Greece. Thematic books with historic details (in french) published from 1994 to 1997. Book: 30x25 cm. Simple to build but good looking. Coal-mine from nord of France. This designer from Toulouse has created several architectural models at different scales. Distributed locally in Toulouse, several are in the S&S catalog. In november 1999, I got a list from Jean-Louis with 16 models. Now (december 2000) he has a web site. In 1990-91, an exotic bird's cardmodel was printed on backside of Heudebert toast pack. During September 1999, an advertising for Montreal airports was included in several aeronautical magazines and it was a very simple 747 diecut papermodel (flat profile, not so good). Currently, the french firebrigade of Paris give a simple model of a light fireengine with here calendar 2000. Each issue of this magazine dedicated to Citroën car's fans propose a simple cardmodel. Published in September 2000 by a designer known for his comics trips models, this car of Gaston Lagaffe is famous. Booklet of size 30x35cm with 6 color sheets, 1 heavy cardstock sheet for the wheels and a windshield in rhodoïd: 50 parts for this model at scale 1:18 and length 23cm. Three cardmodel's series are published. With each model is a booklet with documentation and assembly instructions in french and english. Period-armchairs : 11 models at scale 1:6. Very interesting serie with original and nice models. Each model in a 3 pages booklet (23x32cm) in 8 to 12 parts. Fishing sail boats : 4 models at scale 1:100 - Thonier-Dundee, Langoustier, Bateaux-boeufs et Lougre (waterlined with stand). Cahiers-Maquettes Junior : 6 simple cardmodels for kids : drakkar, seaplane, dinosaurus, mammouth and whale. The graphic quality of printed leaflet and models is very high. Since many years AJP is a designer of hictorical planes models in resin. In 2001 he presents a first cardmodel: the Antoinette at scale 1:48. 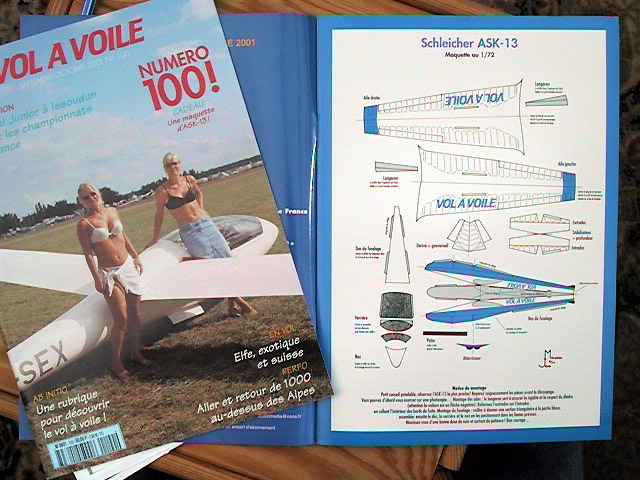 To celebrate his #100 issue, a model of ASK-13 sailplane was proposed at scale 1:72. Time to time cardmodels are inserted in this railway modelism magazine (water tanks in #). 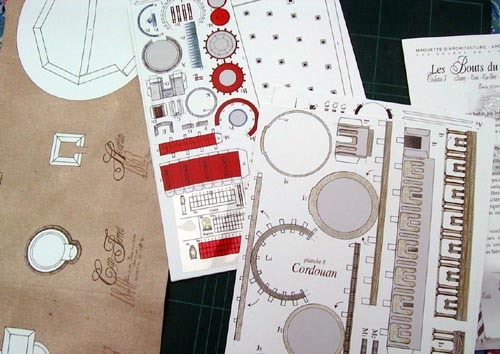 A special booklet (Tendance CLAP by Jacques Le Plas) published in April 2004 issue explains use of cardmodels to complete the layout decoration. In July and August 2004 issues several color sheets are proposed to assemble a modular PLM station (paper to glue on hard cardstock). 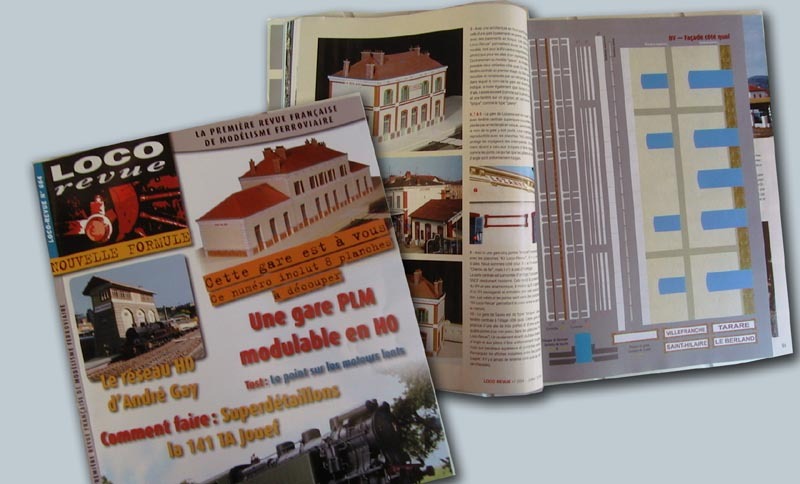 Since 2005,this magazine publish regularly cardmodels of railway buildings. 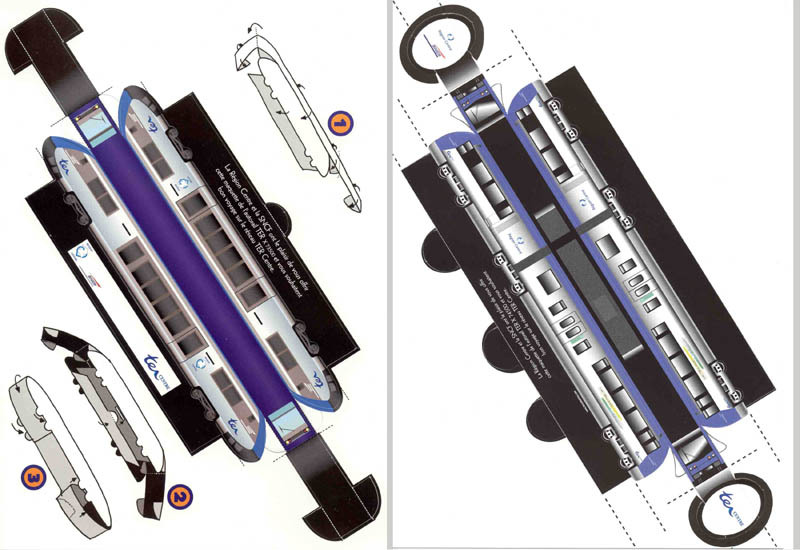 To celebrate the beginning of operation of new railcars X73500 and X74500, Center of France Regional Council printed and distributed two cardmodels for children at the autumn 2004. 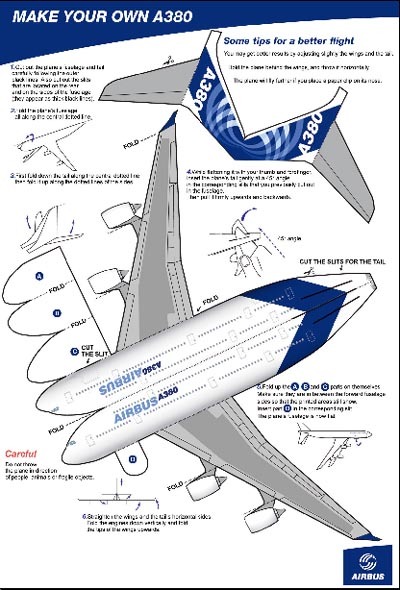 For the first flight of the A380 Airbus in June 2005, Airbus industry published two very simplistic cardmodels. 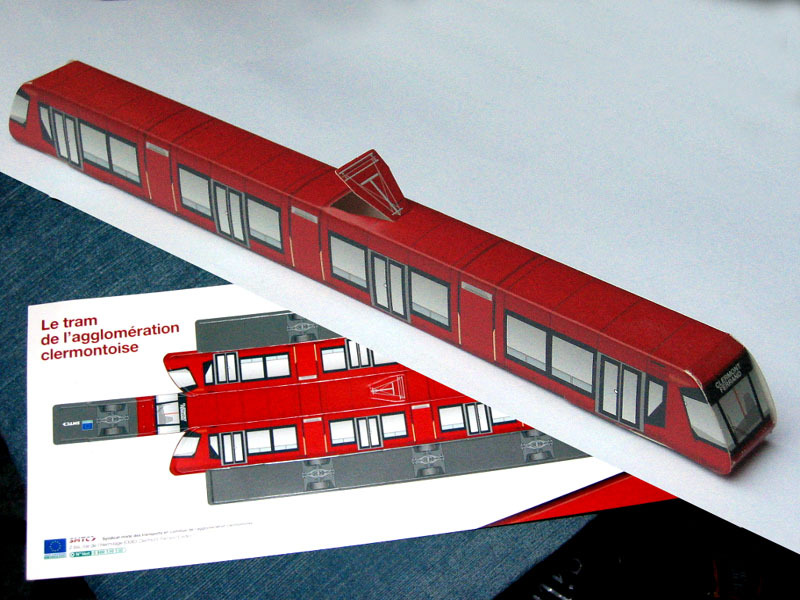 To promote the new Translohr tram in Clermont-Ferrand, the SMTC company published in 2006 a small model of the tram. To celebrate Paris-Dakar 2007 rallye, Renault-Trucks published a truck cardmodel.